It’s the Kaijucast FanVasion crew in the Godzilla Room in Shinjuku! I’m back from Japan and finally done with the jet lag (hopefully)! 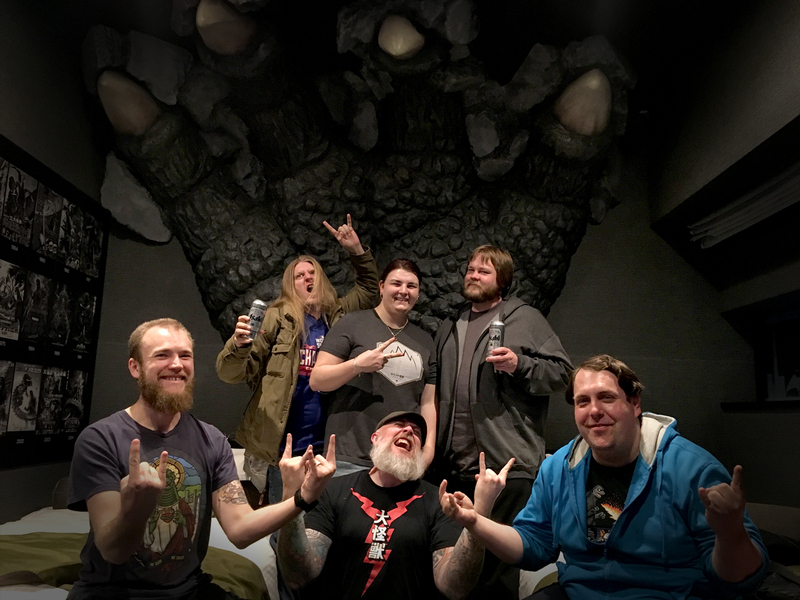 This episode was recorded in the Shinjuku Gracery’s Godzilla Room with the crew from our first official Kaijucast listener trip to Japan. We had an amazing time there and we hope you enjoy the episode as we share some of our favorite experiences from Tokyo! There are a lot of new voices for you to parse though – we had James Thomsen (from Canada), Jessica Etchells (from Rhode Island), Mike Weber (from Chicago), James Yance (aka the Mayor of Dinosaurs) and Clancy Petersen (who you’ve probably heard before on the podcast since he’s in Portland). So just for a lark, I wrote down all of the awesome things we did during this trip. It’s like 20 amazing things! Oh, you want to see the list? Here you go: Ultraman Street, Toho Studios, Akihabara, Mount Takao, Kadokawa Studios, Superfestival 73, Nakano Broadway Mall, Ghibli Museum, Fleeing crowd extra filming, Bullet Train Ride, Koriyama, M1 tour, Shinjuku Gracery Hotel, the Godzilla Room, Odaiba’s Giant Gundam, Tokyo Tower, Zojiji Temple, Sumo Wrestling and finally…. Kaiju Sakaba! BOOM!!! Our 6th annual Emergency Broadcast is on the books and should be on your calendar! We will have special guests, a chat room for the listeners and lots of giveaways during the episode. Mark your calendars and be prepared for awesomeness on January 29th at 2pm Pacific time! That means 5pm eastern, 4pm central, 3pm mountain. Here’s a handy FB event link for you to bookmark! We hope to see you in the chatroom!